Thanks to everyone who helped to make 2015 and the Marques of Italy celebration a huge success! We're taking a deep breath and gather up the data. Roughly speaking it appears that we had over 270 Italian Cars show up over the 2015 weekend. WE fed 271 people for dinner on Friday Nite and 600 on Staruday for lunch. It was a RECORD YEAR! $400,000 was raised for the Pittsburgh Vintage Grand Prix Charities! 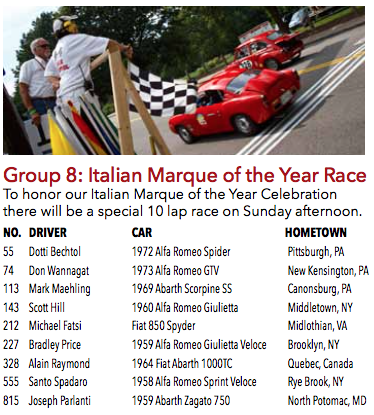 2015 is going to be the BIGGEST year ever in the history of the Cortile at the #PVGP!!!! The Cortile is honored to host the Pittsburgh Vintage Grand Prix's "Marque of the Year 2015" celebration of "The Marque of Italy"
All eyes will be on the Cortile car shows as we not only host the Fiat FreakOut 2015 but also many many rare and special Ferrari's, Lamborghini's, Alfa Romeo's, Lancia's and several other Specialty Italian marques that we guarantee will leave your jaw dropped the whole weekend. 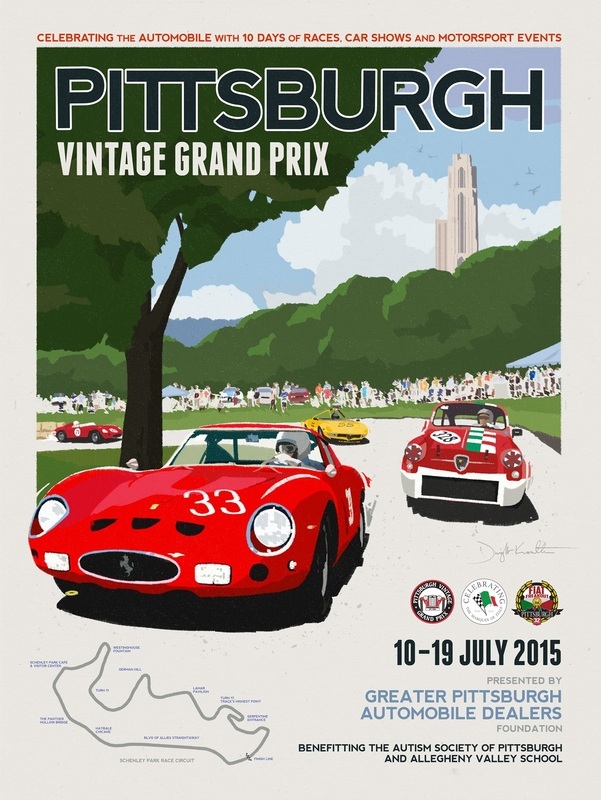 The 2015 Pittsburgh Vintage Grand Prix is celebrating "The Marques of Italy". There are so many beautiful Italian cars that it is just too difficult to select just one to recognize. What's your favorite? Ferrari, Lamborghini, Maserati, Alfa Romeo, Fiat, Abarth, Lancia or maybe one of the lesser known brands like Isotta Fraschini, Bandini, Siata or Stangueillini. They are all welcome and we hope to see more than 400 cars! Italian cars of all years and all will be featured throughout all ten days of our event, including an All Italian race at Schenley Park on Sunday July 19. If you own a new or vintage Italian car or are just a fan, the 2015 Pittsburgh Vintage Grand Prix is the place to be this summer! The PVGP is the nation's largest vintage race event, covering ten full days that includes racing, car shows and parades . 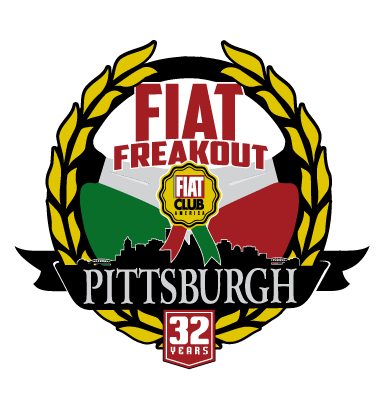 To add to the excitement the Grand Prix and the Cortile are also hosting the Fiat Club America's FreakOut Annual Convention during the July 15-19 Schenley Park weekend. This event typically draws 200 Fiats from all over the country. Combined with our Italian Marque we are expecting close to 400 cars in the Cortile - filling the 18th fairway! The Italian Cortile will host all Italian Car events this year from its location at the Pittsburgh Golf Club on the 18th hole of the golf course. The Cortile was formed by the PVGP's Bernie Martin in 2009 in response to the overwhelming success of the 2008 Marque of the Year which also honored all Italian cars. Now in it's 7th year the Cortile has grown into one of our events favorite shows. Schenley Park Race Weekend – July 18/19 The main event on Saturday and Sunday features a special display area for 400 Italian cars as part of the 2,000 car International Car Show. Throughout the weekend watch vintage races on the nearby city streets. Details Many events will occur during this ten day event, so please don't hesitate to contact Bernie Martin if you have any questions. In cooperation with the Fiat Club America the Cortile is excited to announce that the Proiettore Macchina for 2015 is Fiat! Each year the Fiat Club of America selects a location for their annual North America convention called the Fiat FreakOut. In 2015 the FreakOut will be held at the Cortile! In 1982 there was a group called Fiat Club of America, founded by FIAT owner Santo Bimbo in New York. Santo ran a hand typed correspondence newsletter that was mostly composed of letters from members who wanted to share their experiences of FIAT and Lancia cars. Santo wanted Fiat Club of America to remain a correspondence club while some his members wanted to get together to share the enthusiasm on road trips and get togethers. The original idea was to come up with a “Freak Sheet” to share information between like minded members on a regular basis. Enthusiasts Bobb Rayner and Dwight Varnes decided to meet in 1982 and discuss an idea for gathering like minded enthusiasts in eastern Pennsylvania. Ironically it was the same year that FIAT and Lancia distribution ceased in leave North America. The original name of the new club was Fiat Lancia Underground or “FLU”, since it had no affiliation with FIAT S.p.A. and they were on their own without factory support. Scott Hill designed a FLU logo, inspired from the top of a peanut butter jar lid! The club grew quickly and decided to print their own newsletter to announce events, post member stories and offer helpful tech tips. Over the years the club grew and Chapters began to form throughout North America. Eventually over 25 Chapters joined the ranks. Bobb and Dwight put together a summer meeting for Fiat Lancia Underground in 1983 at Pocono Raceway and named the show FIAT FreakOut. Since then the FIAT FreakOut has grown to become the annual event that members enjoy from all over the world. From it’s modest beginnings in Pennsylvania, the Freak Out has been held throughout the United States. In 1986, the club decided to change it’s name to Fiat Lancia Unlimited to welcome all Italian automobiles and widen it’s appeal to enthusiasts all over the world. The "Freak Sheet" evolved from a newsletter into a magazine called “Ricambi” that is published 6 times per year. FIAT FreakOut moved from Hagarstown to Poughkeepsie, NY, then to Fontana, NC, Grand Island, NY, Dunkirk, NY, Canaan Valley, WV, Asheville, NC, Osage Beach, MO, Detroit and finally back to the Poconos for the 25th Anniversary FreakOut in 2008. In 2014 the Freak Out was held in Chicago and the 2015 Freak Out will be held at the Cortile in the Pittsburgh Grand Prix. Ricambi magazine has blazed the trail along the way. Brett Melancon took over for Darryl and Deb Stacy in 1997. A full color magazine was created to replace the black and white one from before. The publication expanded to cover more chapters, more activities, events and stories from the road. The issue went from standard 16 pages to 32 pages, even a 64 page issue was done for the 20th anniversary in 2003. Ricambi has got better and better, going to a full glossy paper in 2009 and even higher production quality in 2010. Ricambi is the only club magazine of it’s kind, packed with full color reader submitted stories, technical articles, editorials and helpful vendor listings and ads. After the FIAT-Chrysler alliance in 2009, Chrysler sent representative Lisa Barrow and a brand new 2008 FIAT 500 Lounge to FIAT FreakOut for the club members to see. It was the first time a manufacturer owned FIAT 500 had been shown outside of an indoor auto show in North America. Lisa did a fantastic job as the ambassador of FIAT to FLU members. Local TV stations and Motorweek ran great photos and helped build the anticipation toward what was in store. FIAT FreakOut’s 2010 show was held in Asheville the summer of 2010, and the new FIAT team with Laura Soave joined us for the show to celebrate imminent return of FIAT to North America. Ms. Laura made a surprise announcement at the show that FLU members would be the very first to reserve one of 500 new cars called the Prima Edizione 500. FIAT had 2 new cars on display at FreakOut and a special state of the art kiosk complete with a cafe and boutique. The members enjoyed hot cappuccino and frozen gelato and the company of the 20 member Chrysler-FIAT entourage. In 2013, FLU officially changed it’s name to Fiat Club America. 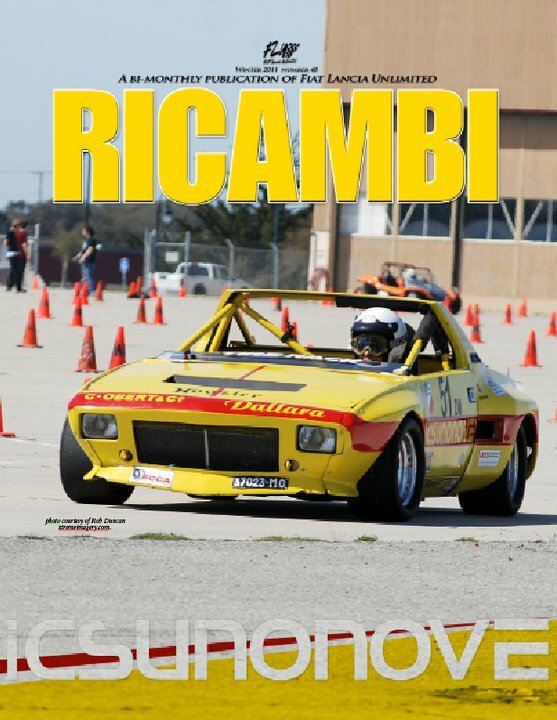 Ricambi is a full color magazine dedicated to the FIAT and Lancia Italian car ownership experience! Ricambi is also the historic chronicle of Fiat Club America’s members and brings the club’s adventures to life every single issue. Our members send in their own stories from around the corner or around the world. Find out information about your car with tech articles and advice, network with our fine parts and service vendors. We have a lot of fun and it shows. To check out a sample of a recent issue featuring the new Abarth, click here. The magazine comes with FCA membership and is published several times per year in full color. Ricambi is packed with great stories, tech articles, editorials and member experiences from North America and all over the world. It also features helpful tips, resources and interesting new products. Ricambi is produced and supported by FCA members from all over the world. Hundreds of writers have contributed to our magazine, and you can be our next writer. Got a a great FIAT or Lancia story to share? We would love to share your story, tech tip or perhaps your initial experiences with your new FIAT 500. How about writing us a story? Your story? That’s what makes a better club, when you join in the fun! Have you heard of the FIAT FreakOut? It’s just like FLU Co founder Bobb Rayner says…”It’s better than Christmas!” FIAT FreakOut is the one weekend per year when all sense and reason go out the window! We love our cars and want to share our enthusiasm and friendship every year. So we get our vehicles ready for and bring them from far and wide where we can all get together in one place for a few days. So what do we do at FFO? FreakOut is an unforgettable weekend enjoying your car, your company of friends and family. The weekend usually starts on Thursday with a special event, then Friday the action really gets going with an activity, a short drive, pool party, dinner and a drive in movie. Then on Saturday it’s the big concours car show then a short afternoon drive. After a short break, it’s the big Saturday night banquet party! Sunday morning is a raffle prize breakfast then another closeout event activity before we drive home to reality once again. There is a spirit of friendship and fun no matter where we go or what we do there. It’s always a great adventure, the kind you will one day fondly recall when you’re old and gray. In 2015 we held an ALL ITALIAN Race. This is the list of cars that participated.